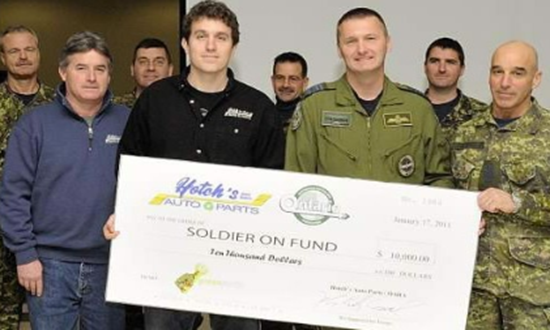 Hotch’s Auto Parts and the Ontario Automotive Recyclers Association (OARA) presented the Soldier On Foundation with a cheque for $10,000 on January 17th following a presentation at CFB Trenton for both Canadian Forces members and civilians alike. This donation will be used to continue support for Canadian Forces soldiers which have been wounded and disabled in the line of duty. “Given the current economic climate and belt tightening that we are seeing nation-wide it is great that organizations such as OARA and Hotch’s Auto Parts can step up to the plate and make a contribution to such a great program,” said Warren Kennedy, long time contributor to Soldier On. Fund creator WO Andrew McLean was on hand to provide details about the program. “Soldier On is unique in that its primary focus is in the rehabilitation and re-integration of wounded CF members into fitness and sports programs. Frequently Canadian Forces members are very active in the sports community and losing a limb or the ability to use a limb is devastating, both mentally and physically. Soldier On ensures that these individuals can obtain the specialized and expensive equipment required to continue to participate in the sports they have always competed in. Soldier On also provides the networking and support needed to link up with disabled sports initiatives across North America,” stated McLean. “We are very happy to be part of such a forward looking organization. With organizations and companies cutting back all across Ontario it is fantastic that OARA’s members have stepped up in such a big way. On behalf of all OARA members, Hotch’s Auto Parts is proud to be able to help the Soldier On foundation continue to help Canadian Forces members which have given so much for our country,” said Corey Earl, Operations Manager at Hotch’s Auto Parts.